Photo taken in Maricopa Co., Arizona. One common host plant for this butterfly in the Sonoran Desert is Desert Mistletoe -- Phoradendron californicum. Another is Mistletoe (Phoradendron macrophyllum). 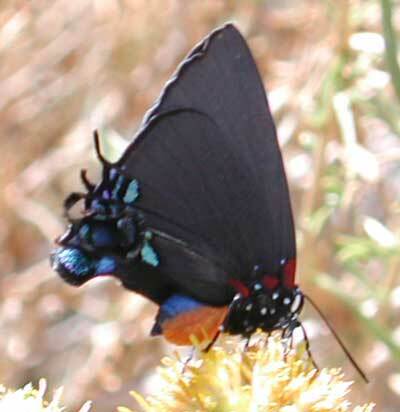 One of the desert's most striking butterflies uses mistletoes as food plants in the larval stage. In the springtime Great Purple Hairstreaks congregate on hilltops. Male butterflies fight for supremacy and the right to occupy the highest point. A female butterfly that comes to find a mate on the hill may choose this "alpha" male. Many desert insects "Hill Top" in order to find mates. It is theorized that this strategy has evolved to accommodate scarce, widely dispersed species. These butterflies are highly attracted to nectar sources, particularly Catclaw Acacia (Acacia greggii) and Alkali Goldenbush (Isocoma acradenia). This is the best place to try capturing images of the adult butterflies.